For the English rock band, see New Model Army (band). For other uses, see New Model Army (disambiguation). The New Model Army of England was formed in 1645 by the Parliamentarians in the English Civil War, and was disbanded in 1660 after the Restoration. It differed from other armies in the series of civil wars referred to as the Wars of the Three Kingdoms in that it was intended as an army liable for service anywhere in the country (including in Scotland and Ireland), rather than being tied to a single area or garrison. Its soldiers became full-time professionals, rather than part-time militia. To establish a professional officer corps, the army's leaders were prohibited from having seats in either the House of Lords or House of Commons. This was to encourage their separation from the political or religious factions among the Parliamentarians. The New Model Army was raised partly from among veteran soldiers who already had deeply held Puritan religious convictions, and partly from conscripts who brought with them many commonly held beliefs about religion or society. Many of its common soldiers therefore held Dissenting or radical views unique among English armies. Although the Army's senior officers did not share many of their soldiers' political opinions, their independence from Parliament led to the Army's willingness to contribute to the overthrow of both the Crown and Parliament's authority, and to establish a Commonwealth of England from 1649 to 1660, which included a period of direct military rule. Ultimately, the Army's Generals (particularly Oliver Cromwell) could rely both on the Army's internal discipline and its religious zeal and innate support for the "Good Old Cause" to maintain an essentially dictatorial rule. The New Model Army was formed as a result of dissatisfaction among Parliamentarians with the conduct of the Civil War in 1644. Although the Parliamentarians had a clear advantage in financial resources and manpower over the Royalists, most of their forces were raised by local associations of counties, and could rarely be used far from their homes. As early as 2 July of that year, Sir William Waller discovered that his London-based units were refusing to campaign further afield, and wrote, "An army compounded of these men will never go through with your service, and till you have an army merely your own that you may command, it is in a manner impossible to do anything of importance". On 6 January 1645, the Committee of Both Kingdoms established the New Model Army, appointing Sir Thomas Fairfax as its Captain-General and Sir Philip Skippon as Sergeant-Major General of the Foot. The Self-denying Ordinance took time to pass the House of Lords, but came into force on 3 April 1645, about the same time as the New Model Army first took the field. Although Oliver Cromwell (who was the Member of Parliament for Cambridge) handed over his command of the Army's cavalry when the Ordinance was enacted, Fairfax requested his services when another officer (Colonel Bartholomew Vermuyden) wished to emigrate. Cromwell was commissioned Colonel of Vermuyden's former regiment of horse, and was appointed Lieutenant General of the Horse in June. Cromwell and his son-in-law Henry Ireton (the New Model Army's Commissary General, or second in command of the cavalry) were two of the only four exceptions to the Self-denying Ordinance, the other two being local commanders in Cheshire and North Wales. They were allowed to serve under a series of three-month temporary commissions that were continually extended. Parliament decreed the consolidation of most of their forces outside the New Model Army into two other locally recruited armies, those of the Northern Association under Sydenham Poyntz and the Western Association under Edward Massey. They were intended to reduce the remaining Royalist garrisons in their areas and prevent Royalist incursions. Some of their regiments were reorganised and incorporated into the New Model Army during and after the Second English Civil War. The New Model Army consisted on paper of 22,000 soldiers, comprising eleven regiments of cavalry each of 600 men for a total of 6,600, twelve regiments of infantry each of 1,200 men for a total of 14,400, and one regiment of 1,000 dragoons. Units from the existing Parliamentarian armies of the Earl of Essex, the Southern Association under Sir William Waller and the Eastern Association under the Earl of Manchester were reassigned to provide regiments for the new army. Although the cavalry regiments were already well up to strength and there was no shortage of volunteers, the regiments of foot soldiers needed 7,000 reinforcements to be brought up to full strength. Men were impressed from Parliamentarian-held areas in the South and East to provide the necessary drafts, but many of these soon deserted and the Army was still 4,000 men short of its paper infantry establishment in May 1645. A "Soldier's catechism" set out new regulations and drill procedures. The standard daily pay was 8 pence for infantry and 2 shillings for cavalry. The administration of the Army was more centralised, with improved provision of adequate food, clothing and other supplies. Cavalrymen (often recruited from among yeomen or the more well-to-do farmers) had to supply their own horses. The founders intended that proficiency rather than social standing or wealth should determine the Army's leadership and promotions. Many officers (often the gentlemen amateurs) of existing units merged into regiments of the New Model Army became surplus to the organization and were discharged. Such reformadoes demonstrated several times in London as they sought compensation or relief. Many corporals and sergeants, particularly in the Earl of Essex's army, were unable to find posts in the merged regiments, but they were persuaded to serve as ordinary soldiers. Contemporary accounts reported that this was due to the popular Sir Philip Skippon's success in exhorting them to stay on, but historians have suggested that the reasons were economic: the former non-commissioned officers (NCOs) did not think they could find work outside the Army. An observer, Sir Samuel Luke, who was one of the officers discharged from the Earl of Essex's Army, wrote on 9 June 1645 that the Army was "the bravest for bodies of men, horse and arms so far as the common soldiers as ever I saw in my life". However, he later complained that many soldiers were drunk, and that many officers were hard to tell from ordinary soldiers. Cromwell accepted only soldiers and, especially, officers who were dedicated to Protestant ideals, as he was. Earlier during the Civil War (in September 1643) he had written to Sir William Spring saying that he would "rather have a plain, russet-coated Captain, that knows what he fights for, and loves what he knows, than what you call a Gentleman and is nothing else". During the Army's formation, some Presbyterians considered it a hotbed of Independents, a potentially dangerous situation given that Parliament's agreement with the Scottish Covenanters stipulated that Presbyterianism would be the established Church in England. Several prominent Presbyterian officers, mainly expatriate Scottish professional soldiers, refused to serve in the New Model Army on religious grounds. Two of the first Colonels appointed in the Army (Edward Montagu and John Pickering) were known extreme Independents. Pickering even preached sermons to his troops, for which Fairfax reprimanded him. The Earl of Essex brought a motion in the House of Lords to prevent Montagu and Pickering, and 40 Captains who were reportedly of the same persuasion, from holding commissions, but after a tied vote, the motion was not passed to the House of Commons and they were allowed to serve. 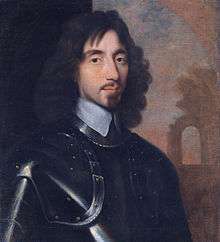 Prince Rupert of the Rhine, an archetypal cavalier and prominent general in the army of King Charles I, nicknamed the New Model troops "Ironsides". This referred to their ability to cut through opposing forces. The Oxford English Dictionary dated the earliest use of the phrase "New Model Army" to the works of the Scottish historian Thomas Carlyle in 1845, and the exact term does not appear in 17th or 18th century documents. Records from February 1646 refer to the "New Modelled Army"—the idiom of the time being to refer to an army that was "new-modelled" rather than appending the word "army" to "new model". Horse Sir Thomas Fairfax's Regiment Army of the Eastern Association Formerly part of Oliver Cromwell's double regiment of 'Ironsides'. Sir Thomas Fairfax's Lifeguard (formerly the Earl of Essex's Lifeguard troop) formed extra senior troop. Horse Edward Whalley's Regiment Army of the Eastern Association Formerly part of Oliver Cromwell's double regiment of 'Ironsides'. Richard Baxter served as chaplain July 1645–July 1646. Horse ** Nathaniel Rich's Regiment Army of the Eastern Association Formerly the Earl of Manchester's Regiment. Originally intended for Algernon Sydney, who declined the appointment due to health concerns. Rich had earlier been rejected by the Commons for a colonelcy. Horse Bartholomew Vermuyden's Regiment Army of the Eastern Association Taken over by Oliver Cromwell after Naseby. Vermuyden, one of the last non-English regimental commanders, resigned in July 1645. Horse Richard Graves' Regiment Army of the Earl of Essex Formerly the Earl of Essex's Regiment. After June 1647, it was commanded by Adrian Scrope. It was disbanded after 1649 Leveller Mutiny at Burford. Horse Sir Robert Pye's Regiment Army of the Earl of Essex Originally intended for Nathaniel Rich, whose nomination was the only colonelcy rejected by the Commons, though he later received a commission when Algernon Sydney declined his nomination. Pye replaced by Matthew Tomlinson in 1647. Foot * Edward Montagu's Regiment Army of the Eastern Association Montague withdrew from the Army when he was elected MP for Huntingdonshire October 1645. Replaced by John Lambert. Foot ** John Pickering's Regiment Army of the Eastern Association Pickering died of an illness at Antre and was replaced by John Hewson in December 1646. Foot ** Thomas Rainsborough's Regiment Army of the Eastern Association Originally intended for Colonel Ayloff, who refused to serve in New Model Army. Foot Richard Fortescue's Regiment Army of the Earl of Essex Fortescue replaced by John Barkstead in 1647. This regiment suffered the deaths of three successive lieutenant colonels in battle. It was unusual for such high-ranking officers to die. Foot Edward Harley's Regiment Army of the Earl of Essex Originally intended for Colonel Harry Barclay, a Scottish colonel. Harley did not serve in 1645, as he was still recovering from wounds. Lieutenant Colonel Thomas Pride commanded in his absence, and succeeded to command in 1647. Foot Walter Lloyd's Regiment Army of the Earl of Essex Originally intended for Colonel Edward Aldrich, who refused to command this particular regiment because it was composed of soldiers from many different precursor regiments. Lloyd died in battle in June 1645 and was replaced by William Herbert, who was in turn replaced by Robert Overton in 1647. Foot Ralph Weldon's Regiment Army of the Southern Association Originally the "Kentish Regiment". Weldon was replaced by Robert Lilburne in spring 1646 when Weldon was appointed governor of Plymouth. Weldon's Lieutenant Colonel, Nicholas Kempson, was passed over for promotion and undermined Lilburne's command. * = a significant effort by the House of Lords to block appointment. ** = a significant effort by the House of Commons to block appointment. The New Model Army's elite troops were its Regiments of Horse. They were armed and equipped in the style known at the time as harquebusiers, rather than as heavily armoured cuirassiers. They wore a back-and-front breastplate over a buff leather coat, which itself gave some protection against sword cuts, and normally a "lobster-tailed pot" helmet with a movable three-barred visor, and a bridle gauntlet on the left hand. The sleeves of the buff coats were often decorated with strips of braid, which may have been arranged in a regimental pattern. Leather "bucket-topped" riding boots gave some protection to the legs. Regiments were organised into six troops, of one hundred troopers plus officers, non-commissioned officers and specialists (drummers, farriers etc.). Each troop had its own standard, 2 feet (61 cm) square. On the battlefield, a regiment was normally formed as two "divisions" of three troops, one commanded by the regiment's Colonel (or the Major, if the Colonel was not present), the other by the Lieutenant Colonel. Their discipline was markedly superior to that of their Royalist counterparts. Cromwell specifically forbade his men to gallop after a fleeing enemy, but demanded they hold the battlefield. This meant that the New Model cavalry could charge, break an enemy force, regroup and charge again at another objective. On the other hand, when required to pursue, they did so relentlessly, not breaking ranks to loot abandoned enemy baggage as Royalist horse often did. The New Model Army contained one regiment of dragoons, of twelve companies each of one hundred men, under Colonel John Okey. Dragoons were mounted infantry, and wore much the same uniform as musketeers although they probably wore stout cloth gaiters to protect the legs while riding. They were armed with flintlock "snaphaunces" rather than the matchlock muskets carried by the infantry. On the battlefield, their major function was to clear enemy musketeers from in front of their main position. At the Battle of Naseby, they were used to outflank enemy cavalry. They were also useful in patrolling and scouting. In sieges, they were often used to assault breaches carrying flintlock carbines and grenades. The storming party were sometimes offered cash payments, as this was a very risky job. Once the forlorn hope established a foothold in the enemy position, the infantry followed them with their more cumbersome pikes and matchlock muskets. In 1650, Okey's dragoons were converted into a regiment of horse. It appears that after that date, unregimented companies of dragoons raised from the Militia and other sources were attached to the regiments of horse and foot as required. This was the case at the Battle of Dunbar on 3 September 1650. The Regiments of Foot consisted of ten companies, in which musketeers and pikemen were mixed, at least on the march. Seven companies consisted of one hundred soldiers, plus officers, specialists and so on, and were commanded by Captains. The other three companies were nominally commanded by the regiment's Colonel, Lieutenant Colonel and Major, and were stronger (200, 160 and 140 ordinary soldiers respectively). The regiments of foot were provided with red coats. Red was chosen because uniforms were purchased competitively from the lowest bidder, and Venetian red was the least expensive dye. Those used by the various regiments were distinguished by differently coloured linings, which showed at the collar and ends of the sleeves, and generally matched the colours of the regimental and company standards. In time, they became the official "facing" colour. On some occasions, regiments were referred to, for example, as the "blue" regiment or the "white" regiment from these colours, though in formal correspondence they were referred to by the name of their Colonel. Each company had its own standard, 6 feet (180 cm) square. 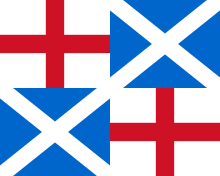 The Colonel's company's standard was plain, the Lieutenant Colonel's had a cross of Saint George in the upper corner nearest the staff, the Major's had a "flame" issuing from the cross, and the Captains' standards had increasing numbers of heraldic decorations, such as roundels or crosses to indicate their seniority. The New Model Army always had two musketeers for each pikeman, though depictions of battles show them present in equal numbers. [lower-alpha 1] On the battlefield, the musketeers lacked protection against enemy cavalry, and the two types of foot soldier supported each other. For most siege work, or for any action in wooded or rough country, the musketeer was generally more useful and versatile. Musketeers were often detached from their regiments, or "commanded", for particular tasks. Pikemen, when fully equipped, wore a pot helmet, back- and breastplates over a buff coat, and often also armoured tassets to protect the upper legs. They carried a sixteen-foot pike, and a sword. The heavily burdened pikeman usually dictated the speed of the Army's movement. They were frequently ordered to discard the tassets, and individual soldiers were disciplined for sawing a foot or two from the butts of their pikes, although senior officers were recommended to make the men accustomed to marching with heavy loads by regular route marches. In irregular fighting in Ireland, the New Model temporarily gave up the pike. In battle, the pikemen were supposed to project a solid front of spearheads, to protect the musketeers from cavalry while they reloaded. They also led the infantry advance against enemy foot units, when things came to push of pike. 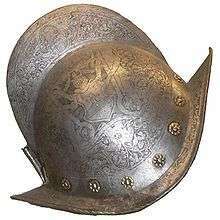 The musketeers wore no armour, at least by the end of the Civil War, although it is not certain that none had iron helmets at the beginning. They wore a bandolier from which were suspended twelve wooden containers, each with a ball and measured charge of powder for their matchlock muskets. These containers are sometimes referred to as the "Twelve Apostles". According to one source, they carried 1 lb of fine powder, for priming, to 2 lbs of lead and 2 lbs of ordinary powder, the actual charging powder, for 3 lbs of lead. They were normally deployed six ranks deep, and were supposed to keep up a constant fire by means of the countermarch—either by introduction whereby the rear rank filed to the front to fire a volley, or by retroduction where the front rank fired a volley then filed to the rear. By the time that they reached the front rank again, they should have reloaded and been prepared to fire. At close quarters, there was often no time for musketeers to reload, and they used their musket butts as clubs. They carried swords, but these were often of inferior quality, and ruined by use for cutting firewood. Bayonets were not introduced into European armies until the 1660s and so were not part of a musketeer's equipment. The establishment of the New Model also included at least two companies of "firelocks" or fusiliers, who wore "tawny coats" instead of red, commanded initially by Major John Desborough. 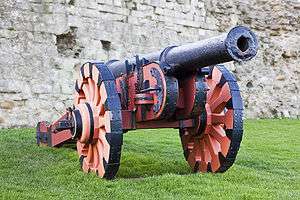 They were used to guard the guns and ammunition wagons, as it was obviously undesirable to have matchlock-armed soldiers with lighted matches near the gunpowder barrels. The New Model did not use tents, instead being quartered in whatever buildings (houses, barns etc.) were available, until they began to serve in the less populated areas of the countries of Ireland and Scotland. In 1650, their tents were each for six men, a file, who carried the tents in parts. In campaigns in Scotland, the troops carried with them seven days' rations, consisting exclusively of biscuit and cheese. The Army took the field in late April or May, 1645. After an attempt to raise the Siege of Taunton was abandoned, the Army began a Siege of Oxford, sending a detachment of one regiment of cavalry and four of infantry to reinforce the defenders of Taunton. After the Royalists captured Leicester, Fairfax was ordered to leave Oxford and march north to confront the King's army. On 14 June, the New Model Army destroyed King Charles' smaller but veteran army at the Battle of Naseby. Leaving the Scots and locally raised forces to contain the King, the New Model Army marched into the west country, where they destroyed the remaining Royalist field army at Langport on 10 July. Thereafter, they reduced the Royalist fortresses in the west and south of England. The last fortress in the west surrendered in early 1646, shortly before Charles surrendered himself to a Scottish army and hostilities ended. Having won the First Civil War, the soldiers became discontented with the Long Parliament, for several reasons. Firstly, they had not been paid regularly and on the end of hostilities, the conservative MPs in Parliament wanted to either disband the Army or send them to fight in Ireland without receiving their back pay. Secondly, the Long Parliament refused to grant the soldiers indemnity (freedom from prosecution for crimes they had been ordered to commit in the Civil War). The soldiers demanded indemnity as several soldiers were hanged after the war for crimes such as stealing horses for use by the cavalry regiments. Thirdly, seeing that most Parliamentarians wanted to restore the King without major democratic reforms or religious freedom, many soldiers asked why they had risked their lives in the first place, a sentiment that was strongly expressed by their elected representatives. Two representatives, called Agitators, were elected from each regiment. The Agitators, with two officers from each regiment and the Generals, formed a new body called the Army Council. After a rendezvous (meeting) near Newmarket, Suffolk on 4 June 1647 this council issued "A Solemne Engagement of the Army, under the Command of his Excellency Sir Thomas Fairfax" to Parliament on 8 June making their concerns known, and also detailing the constitution of the Army Council so that Parliament would understand that the discontent was Army wide and had the support of both officers and other ranks. This Engagement was read out to the Army at a general Army rendezvous on 5 June. 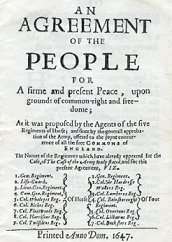 Having come into contact with ideas from some London radicals called the Levellers, the troops of the Army proposed a revolutionary new constitution named the Agreement of the People, which called for almost universal male suffrage, electoral boundary reform, power to rest with a Parliament elected every two years (by the people), religious freedom, and an end to imprisonment for debt. Increasingly concerned at the failure to pay their wages and by political manoeuvrings by King Charles I and by some in Parliament, the army marched slowly towards London over the next few months. In late October and early November at the Putney Debates, the Army debated two different proposals. The first was the Agreement of the People; the other was the Heads of Proposals, put forward by Henry Ireton for the Army Council. This constitutional manifesto included the preservation of property rights and would maintain the privileges of the gentry. At the Putney Debates, it was agreed to hold three further rendezvous. The army remained under control and intact, so it was able to take the field when the Second English Civil War broke out in July 1648. The New Model Army routed English royalist insurrections in Surrey and Kent, and in Wales, before crushing a Scottish invasion force at the Battle of Preston in August. Many of the Army's radicals now called for the execution of the King, whom they called, "Charles Stuart, that man of blood". The majority of the Grandees realised that they could neither negotiate a settlement with Charles I, nor trust him to refrain from raising another army to attack them, so they came reluctantly to the same conclusion as the radicals: they would have to execute him. After the Long Parliament rejected the Army's Remonstrance[lower-alpha 2] by 125 to 58, the Grandees decided to reconstitute Parliament so that it would agree with the Army's position. 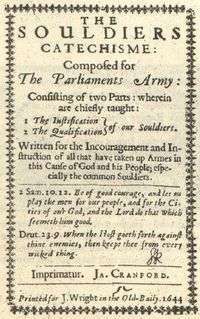 On 6 December 1648, Colonel Thomas Pride instituted Pride's Purge and forcibly removed from the House of Commons all those who were not supporters of the religious independents and the Grandees in the Army. The much-reduced Rump Parliament passed the necessary legislation to try Charles I. He was found guilty of high treason by the 59 Commissioners and beheaded on 30 January 1649. Now that the twin pressures of Royalism and those in the Long Parliament who were hostile to the Army had been defeated, the divisions in the Army present in the Putney Debates resurfaced. Cromwell, Ireton, Fairfax and the other Grandees were not prepared to countenance the Agitators' proposals for a revolutionary constitutional settlement. This eventually brought the Grandees into conflict with those elements in the New Model Army who did. During 1649, there were three mutinies over pay and political demands. The first involved 300 infantrymen of Colonel John Hewson's regiment, who declared that they would not serve in Ireland until the Levellers' programme had been realised. They were cashiered without arrears of pay, which was the threat that had been used to quell the mutiny at the Corkbush Field rendezvous. In the Bishopsgate mutiny, soldiers of the regiment of Colonel Edward Whalley stationed in Bishopsgate, in London, made demands similar to those of Hewson's regiment. They were ordered out of London. Less than two weeks later, there was a larger mutiny involving several regiments over pay and political demands. After the resolution of the pay issue, the Banbury mutineers, consisting of 400 soldiers with Leveller sympathies under the command of Captain William Thompson, continued to negotiate for their political demands. They set out for Salisbury in the hope of rallying support from the regiments billeted there. Cromwell launched a night attack on 13 May, in which several mutineers perished, but Captain Thompson escaped, only to be killed in another skirmish near the Diggers community at Wellingborough. The rest were imprisoned in Burford Church until three were shot in the Churchyard on 17 May. With the failure of this mutiny, the Levellers' power base in the New Model Army was destroyed. Later that year, on 15 August 1649, the New Model Army landed in Ireland to start the Cromwellian conquest of Ireland. The soldiers in this expeditionary force were not the first New Model soldiers to fight in Ireland (many hundreds had fought in the major battles of the previous years) but the scale of the 1649 deployment far exceeded all earlier efforts. Many soldiers were reluctant to serve in this campaign, as Ireland had a bad reputation amongst English soldiers, and regiments had to draw lots to decide who would go on the expedition. The politically and religiously disunited Royalist and Catholic coalition they met in Ireland were at a major disadvantage against the New Model Army. After the shock defeats at Rathmines and Drogheda, many of the Royalist soldiers opposing the Parliamentarian forces became demoralised, melting away at the first opportunity. The Scottish Royalist army in Ulster was badly weakened by desertion before the battle of Lisnagarvey for example. However, resistance by some of the native Irish Catholic forces, who were faced with land confiscations and suppression of their religion in the event of a Parliamentarian conquest, proved stubborn and protracted. Some units, notably the veteran Ulster Confederate Catholic forces, proved resilient enemies. As a result, the New Model soldiers suffered considerably in the campaign. After victories with few Parliamentary casualties at Drogheda and Wexford in 1649, the fighting became more protracted and casualties began to mount. At Kilkenny, in March 1650, the town's defenders skilfully beat back numerous Parliamentarian assaults before being forced to surrender. Shortly afterwards, about 2,000 soldiers of the New Model died in abortive assaults against a breach defended by veteran Ulstermen in the siege of Clonmel. These bloody scenes were repeated during the Siege of Charlemont fort later that year. Thousands more died of disease, particularly in the long sieges of Limerick, Waterford and Galway. The Army was also constantly at risk of attack by Irish guerrillas or "tories", who attacked vulnerable garrisons and supply columns. The New Model responded to this threat with forced evictions of the civilian population from certain areas and by destroying food supplies. These tactics caused a widespread famine throughout the country from 1650 onwards. Overall, around 43,000 English soldiers fought in the Parliamentarian army in Ireland between 1649 and 1653, in addition to some 9,000 Irish Protestants. By the end of the campaign in 1653, much of the Army's wages were still in arrears. About 12,000 veterans were awarded land confiscated from Irish Catholics in lieu of pay. Many soldiers sold these land grants to other Protestant settlers, but about 7,500 of them settled in Ireland. They were required to keep their weapons to act as a reserve in case of any future rebellions in the country. In 1650, while the campaign in Ireland was still continuing, part of the New Model Army was transferred to Scotland to fight Scottish Covenanters at the start of the Third English Civil War. The Covenanters, who had been allied to the Parliament in the First English Civil War, had now crowned Charles II as King. Despite being outnumbered, Cromwell led the Army to crushing victories over the Scots at the battles of Dunbar and Inverkeithing. Following the Scottish invasion of England led by Charles II, the New Model Army and local militia forces soundly defeated the Royalists at the Battle of Worcester, the last pitched battle of the English Civil Wars. Part of the New Model Army under George Monck occupied Scotland during the Interregnum. They were kept busy throughout the 1650s by minor Royalist uprisings in the Scottish Highlands and by endemic lawlessness by bandits known as moss-troopers. In England, the New Model Army was involved in numerous skirmishes with a range of opponents, but these were little more than policing actions. The largest rebellion of the Protectorate took place when the Sealed Knot instigated an insurrection in 1655. This revolt consisted of a series of coordinated uprisings, but only the Penruddock uprising ended in armed conflict, and that was put down by one company of cavalry. The major foreign entanglement of this period was the Anglo-Spanish War. In 1654, the English Commonwealth declared war on Spain, and regiments of the New Model Army were sent to conquer the Spanish colony of Hispaniola in the Caribbean. They failed in the conflict and sustained heavy casualties from tropical disease. They took over the lightly defended island of Jamaica. The English troops performed better in the European theatre of the war in Flanders. During the Battle of the Dunes (1658), as part of Turenne's army, the red-coats of the New Model Army under the leadership of Sir William Lockhart, Cromwell's ambassador at Paris, astonished both their French allies and Spanish enemies by the stubborn fierceness with which they advanced against a strongly defended sandhill 50 metres (160 ft) high. After Cromwell died, the Protectorate died a slow death, as did the New Model army. For a time, in 1659, it appeared that factions of the New Model army forces loyal to different generals might wage war on each other. Regiments garrisoned in Scotland under the command of General Monck were marched to London to ensure the security of the capital prior to the Restoration, without significant opposition from the regiments under other generals, particularly those led by Charles Fleetwood and John Lambert. Following the riots led by Thomas Venner in 1661, which were quelled with the aid of soldiers from Monck's Regiment of Foot and the Regiment of Cuirassiers, the New Model Army was ordered disbanded. However, for their service, both these regiments were, upon the end of the New Model Army, incorporated into the army of Charles II as regiments of Foot Guards and Horse Guards. ↑ Two musketeers for each pikeman, was not the agreed mix used throughout Europe, and when in 1658 Cromwell, by then the Lord Protector, sent a contingent of the New Model Army to Flanders to support his French allies, under the terms of their treaty of friendship, he supplied regiments with equal numbers of musketeers and pikemen (Firth 1898, pp. 76–77). ↑ Full title: "Remonstrance of his Excellency Thomas Lord Fairfax, Lord Generall of the Parliaments Forces. And of the Generall Councell of Officers Held at St. Albans the 16. of November, 1648"
↑ Rogers 1968, p. 207. ↑ Rogers 1968, pp. 208–209. ↑ Rogers 1968, pp. 210–211. ↑ Young & Holmes 2000, pp. 44–46. ↑ Rogers 1968, p. 239. ↑ Young & Holmes 2000, p. 300. ↑ Roberts 2005, p. 128. ↑ Tempest, Stephen. History of Great Britain: Why did the redcoats wear red?, 25 Jun, 2013. ↑ Roberts 2005, p. 50. ↑ Firth 1972, p. 70. ↑ Roberts 2005, p. 69. ↑ Firth 1972, p. 78. ↑ Young & Holmes 2000, p. 47. ↑ Firth 1972, p. 91. ↑ Falls 1969, p. 294. ↑ Firth 1972, p. 81. ↑ Roberts 2005, p. 70. 1 2 Young & Holmes 2000, p. 231. ↑ Firth 1972, p. 88. ↑ Scott-Wheeler, James. Cromwell in Ireland. pp. 151–58. ↑ Firth 1972, p. 248. ↑ Firth 1972, pp. 222–223. ↑ O'Siochru 2008, p. 122. ↑ O'Siochru 2008, p. 206. ↑ Atkinson 1911, p. 248. ↑ Tucker 2009, p. 634. Falls, Cyril (1969) . Great Military Battles. London: Spring Books. O'Siochru, Michael (2008). God's Executioner – Oliver Cromwell and the Conquest of Ireland. London: Faber & Faber. Roberts, Keith (2005). Cromwell's War Machine. Pen and Sword Military. ISBN 1-84415-094-1. Simpson, John (3 May 2013). "The Oxford English Dictionary and its chief word detective". BBC News Magazine. BBC. Tucker, Spencer C. (2009). A Global Chronology of Conflict: From the Ancient World to the Modern Middle East (illustrated ed.). ABC-CLIO. p. 634. ISBN 978-1-85109-672-5. Young, Peter; Holmes, Richard (2000). The English Civil War:A Military History of the Three Civil Wars, 1642–1651. Ware, Hertfordshire: Wordsworth Editions. ISBN 1-84022-222-0. This article incorporates text from a publication now in the public domain: Atkinson, Charles Francis (1911). "Fronde, The". In Chisholm, Hugh. Encyclopædia Britannica. 11 (11th ed.). Cambridge University Press. p. 248.